The Division of Pulmonology and Sleep Medicine in the Department of Pediatrics offers comprehensive treatment of congenital, inherited and acquired disorders of the lungs and respiratory system. 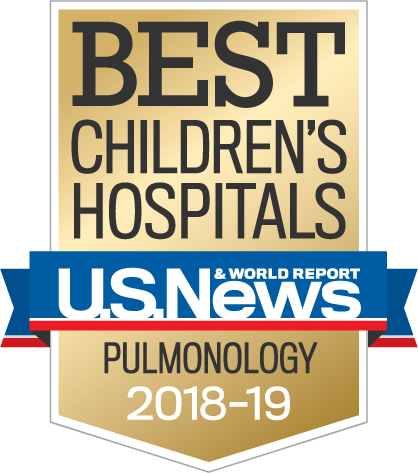 Children's Hospital Los Angeles is ranked among the top hospitals in the nation for pulmonology care on the U.S. News & World Report Best Children's Hospitals List. We are a full-service clinical resource for children with pulmonary, respiratory, and sleep disorders. Our triple-boarded physicians provide care for children throughout the nation, no matter what respiratory illness they may have. This program provides comprehensive, multidisciplinary care for infants with a variety of chronic lung disorders, particularly bronchopulmonary dysplasia, and congenital disorders of the lung, diaphragm, airway and chest wall. Our pulmonologists are leaders in innovative therapies and clinical research for cystic fibrosis. This center – the largest in the southwestern United States – is approved by the national Cystic Fibrosis Foundation, California Children's Services and Genetically Handicapped Persons Program. We also provide for the use of intravenous antibiotics at home after hospital discharge for cystic fibrosis patients. Treatment is maintained by patient and family, with the assistance of a team of trained nurses and pharmacists on an out-patient basis. Learn more. Diaphragm pacing is a unique treatment used to provide chronic ventilatory support for selected children who require mechanical ventilation. Diaphragm pacing is for patients with Congenital Central Hypoventilation Syndrome (CCHS). Children's Hospital Los Angeles is one of the three largest centers for Diaphragm Pacing. The Fiberoptic Bronchoscopy Program provides detailed and efficient analysis of airways, lung inflammation and infection without surgery. Children’s Hospital Los Angeles has one of the largest pediatric home mechanical ventilation programs in the world. We have successfully discharged well over 600 infants, children and adolescents who require part-time or full-time mechanical assisted ventilation to their homes. This permits them to participate more fully in their family life, go to school, go on family vacations and more. While we provide families with the tools (medical technology and expertise) to make this work, it is the creativity and courage of the families who fashion these tools to create meaningful lives for their children. The Respiratory Failure (Home Mechanical Ventilation) Program features close coordination between the program pulmonologist and nurse, family, home nurses, durable medical equipment providers, payers and primary care physicians. Pulmonologists within the Interstitial Lung Disease Program have the expertise, experience and facilities to treat this rare childhood problem with the latest approaches for long-term patient management. The Division offers the only sleep laboratory in Los Angeles devoted solely to infants and children. The laboratory is directed by two physicians, Sally Ward, MD, and Iris Perez, MD, both of whom are board-certified by the American Board of Pediatrics in Sleep Medicine. Referrals can be made to either our Pulmonary Function or our Sleep Laboratories directly; with or without a pulmonary consultation request. Our hospital has a family-friendly four-bed Sleep Center staffed by licensed therapists, nurses, and technicians. The laboratory performs daytime nap testing as well as full overnight polysomnography testing and is open 24 hours per day, seven days per week. Learn more. In conjunction with the Division of Orthopedic Surgery, our Division evaluates and manages children with restriction of lung growth and development from chest wall abnormalities. These include: Skeletal dysplasias, Early scoliosis, Scoliosis associated with neuromuscular diseases, Pectus Excavatum and other conditions that cause restriction of the lung growth and development.